Welcome to Silvercrest. The caviary is located in the beautiful Willamette Valley of Oregon. 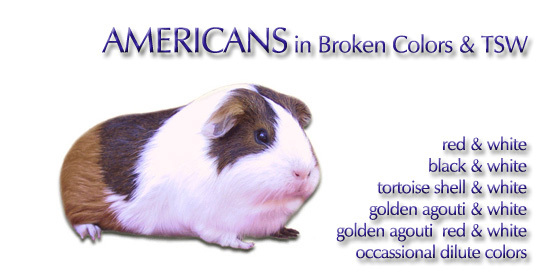 As a breeder and exhibitor of American cavies in Intense Broken colors, I am committed to improving their type, patching and distribution of patching. Silvercrest recently expanded to include the Tortoise Shell & White variety. A project is underway to develop a small Dilute Agouti Broken line and a Black/White line. Litters arrive periodically, and because the Broken and TSW lines are developing, the best stock remains at Silvercrest for showing and breeding. Enjoy the website! .American Broken Color Breeder & Exhibitor.